U.S. veterans deal with the collateral damage of military service in this collection of often surprisingly understated stories. An alcoholic veteran of the Afghanistan campaign is bailed out of jail by another vet who lost his legs (”To the Lake”). A vet’s broken marriage leaves his son with at least a bad physical scar, and the father eventually re-enlists (“Sea Bass”). A mother visits her veteran son in prison, eventually carrying there a box of letters he wrote to the father of the man he killed in a “drunken scrap” two months after being discharged (“Visitors”). Mogelson, who served in the National Guard without being deployed, spent almost three years as a freelance journalist in Afghanistan. The stories in this debut have the hard edge and sharp dialogue of well-observed reporting. In “A Human Cry," in which Mogelson draws a link between Army-supplied dentures and a death by farm mower, a brief scene captures a “big girl” in fishnet stockings, “little flesh diamonds pushing through the webbing like string-tied ham.” Like the mower, other common items—a chef’s knife, a car, a table saw—can cause mayhem stateside for the vet accustomed to military weapons. Only one story (“Kids”) is fully engaged in combat, and it hangs on whether the action of a local boy is meant to warn or harm U.S. soldiers. All the stories rely on some measure of ambiguity and indirectness (unlike the hammering anti-war irony of the e.e. cummings poem from which the book’s title is drawn). The fallout from PTSD may be everywhere, but the term and discussions thereon are MIA—and the stories as a result are broader and better. 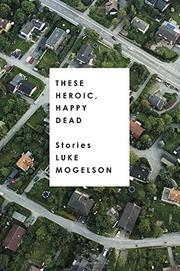 Mogelson shows impressive range and restraint in an area—war-related fiction—in which physical and emotional extremes have been too readily deployed and exploited.